Matisse could draw, make no mistake about that. He knew anatomy, he knew faces and hands. But in his paintings—go look at his paintings to verify this—he was not interested in showing off how convincingly he could render this or that. He wasn’t illustrating. He was interested in the painting as a whole, how your eye moves through it without pinning you down at any one part. Details pin the viewer down. Details put you into a fussy frame of mind, as in, did the artist get this RIGHT?! Details reduce your viewing experience into a check list: face, check; hair, check; hands, check, and so on. Pedantic, boring. 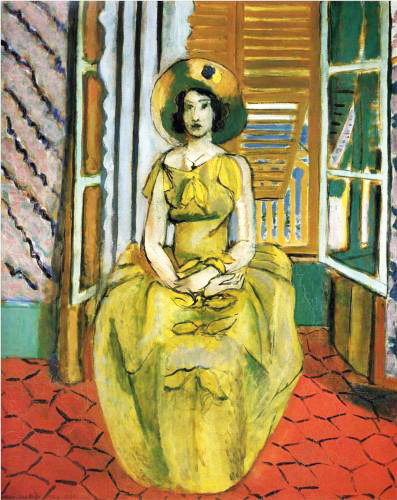 You can see in Matisse’s “Yellow Dress,” 1930, that there’s something wrong with the hands. Specifically, her right wrist. It’s disconnected from the hand. He saw this. Why the disconnect? Because he wanted to get the hands over the row of ribbons down the front of the skirt. In fact, he draws the hands as if they were part of that pattern. They blend in and do not attract attention to themselves. That’s why we accept his departure from anatomical correctness. 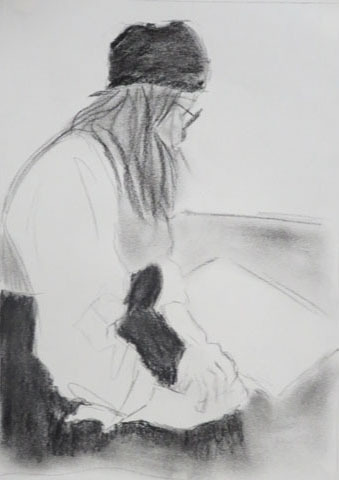 In Maggy Shell’s delicate drawing we see a similar concern for the overall composition and how the eye moves through the whole. The hands, notice, are not detailed. If they were, we would read the drawing with different expectations—narrow, academic ones. 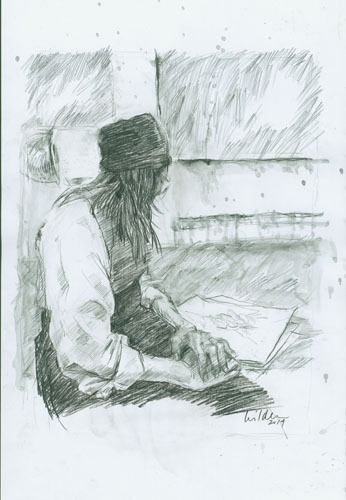 Instead, we get to enjoy a drawing that creates a mood, rather than conveys specific details. The masses of solid shapes (hat, skirt) are not delineated by contour lines. Other forms (sleeve, hands) are suggested through lines only. 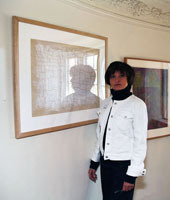 That creates a visual conversation and the viewer goes back and forth, drawn into the subtleties. In this context, the drawing I did of the same motif is too specific about the hands. You can tell that I love drawing hands and that I’m showing off how well I can draw them. Uh-uhh. Not so good for the overall reading of the drawing.